Frame your face with a pair of beautiful brows. Shape and fill your brows with Mary Kay® Precision Brow Liner in Brunette or whichever shade matches your natural hair color roots. Then tint and tame brows with Mary Kay® Volumizing Brow Tint in Dark Brunette. Begin by highlighting the inner corners of your eyes with Mary Kay Chromafusion™ Eye Shadow in Crystalline. Next, sweep Biscotti all over as your base shade. Then apply Rustic to your crease and enhance with Mahogany. Define your eyes with a thin line of Mary Kay® Eyeliner in MK Deep Brown along your upper lash line. Then apply Mary Kay® Ultimate Mascara™ in Black to your top and bottom lashes. 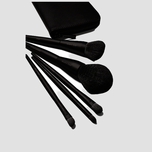 Dust Mary Kay® Mineral Cheek Color in Shy Blush along your cheekbones with the Mary Kay® Cheek Brush. Combine Mary Kay® Gel Semi-Matte Lipstick in Bashful You and Mauve Moment on your lips.